More than 60 people gathered today to create a vision for ‘transit oriented development’ on Broadway. The afternoon of design and planning exercises is part of a community process being driven by the chamber of commerce, Capitol Hill Housing and other Capitol Hill groups to create a community-based set of development priorities for the Broadway light rail station area. Sound Transit, the agency charged with building the new rapid transit line and station, begins the process of developing the property in 2012. The station is slated to open for service in 2016. 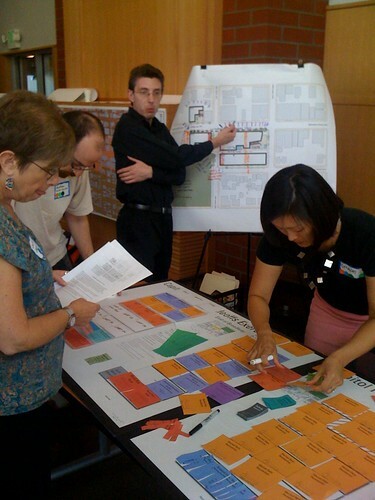 Today’s design charrette involved teams of participants working through exercises in construction design preferences, development tradeoffs and, at times, patience as people and neighbors from diverse backgrounds converged inside the new Seattle University alumni and admissions building that hosted the event. CHS will have more coverage of the workshop including materials from the exercises so anybody can go through the process and provide feedback to help shape what comes next on Broadway.